Quite some time ago, I had a favourite mug. It wasn’t the design so much as it was the size and shape; it was bigger than standard, and kept my tea hot for longer than my other mugs. I came across this mug quite by chance; I think it was a gift from my mother-in-law. But one day, my favourite mug broke. I forget how, I think it was just a clumsy accident on my part. Not unusual. The breaking of the favoured mug kicked off a quest to find a new favourite mug. I embarked on a mug search spanning months. I bought a cool black one, but it turned out to have a manufacturing fault: a bit of ceramic stuck out at the bottom and scratched any surface I put it on. So I tried again, and again. 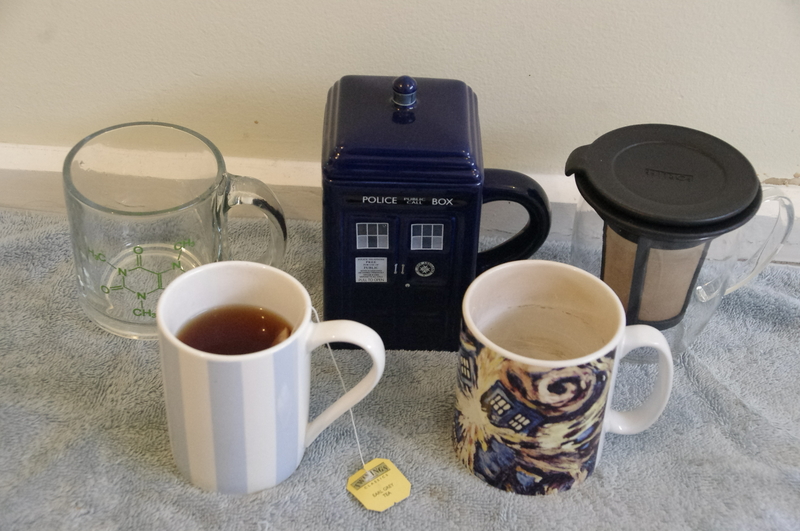 The end result of my search for a favourite mug is that I now have five favourite mugs, and each time I have a cup of tea I feel a slight pang of guilt for not using one of the other four. This entry was posted in Tidbits & Musings and tagged tea.